in Friday's evening's Sam Houston Maiden Classic final at Sam Houston Race Park. 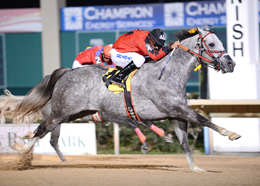 HOUSTON, TX�APRIL 12, 2013�Fastest qualifier Plunge The Depths returned with an equally impressive effort in the $53,400 Sam Houston Maiden Classic final Friday night at Sam Houston Race Park. Under jockey Ricardo Aguirre, the WAVE CARVER colt raced to his second consecutive daylight victory while covering the 350 yard course in :17.625 seconds, a 95 speed index. The $21,360 winner's purse boosted the lightly raced 4-year-old's bankroll to more than $23,000. After winning his March 28 trial by three lengths, Plunge The Depths posted a 1-1/4 length win tonight. Bred in Texas by Joe Kirk Fulton, Plunge The Depths races for Julia Cesar Ramirez and is trained by Willie J. Simien, Jr. The gray colt out of Miss Manolo, by Strawfly Special, was making only his seventh lifetime start. �He disappointed me with his difficult load again,� said Simien. �We gate schooled him on the farm and he loaded really well. Maybe that�s because he knew us. But he left the gate well, better than the trials We were proud." Simien is pointing his 4-year-old to the Open Graduation at Delta Downs. Taste This Corona, who also broke his maiden in the trials and set the second fastest qualifying time, finished a neck in front of Cjs Rocksolid for second. Erasmo Hernandez conditions the 3-year-old for owner Hugo Morales. He picked-up $8,544 for the effort moving his record to 1-1-0 in four starts. Alfonso Lujan was aboard the Lopez Ranch bred. Cjs Rocksolid is a 3-year-old homebred for Rockin J Running Horses. Michael Wakefield saddled the ridden by Jose Vega.Cjs Rocksolid earned $5,874 for the effort. Post-time favorite Plunge The Depths paid $5.20 to win, $4.20 to place and $3.20 to show. Taste Of Corona paid $3.40 and $4.00 and Cjs Rocksolid paid $4.80 to show. Cassinni finished 4th, followed by Tres Alley Cat 5th and Choice Card 6th. Body Of Evidence and King Of Leon dead-heated for 7th followed by A Chick Called Linda and Ophiucus.